I've been not only logging in my translations of each word into my Etruscan database but also the history of each word's translations by various authors. Sometimes there is little consensus in what a word means, sometimes there is unanimity across the board. I even record translations offered by Albanian-obsessed Zachary Mayani because even though I may feel he is of zero worth in Etruscan translation, I may run into those influenced by such authors and can quickly determine the quality of their sources. Recently looking into the word cvil, I noticed a unanimous and overconfident translation of "gift" across authors despite the handful of instances of this word. What's interesting is that the earliest translation of the word I can find so far goes back to Robert Ellis in his 1861 work Armenian Origin of the Etruscans. In it, he asserts that the word means "gift" but relates it directly to Armenian khilay 'gift' (see Ellis. Armenian Origin of the Etruscans , p.123). Of course, as of 2014, we should know that Etruscan is not related to Armenian any more than it is related to Albanian or some other Indo-European language. Etruscan is quite different. Was Ellis's Armenian-influenced translation the unfortunate source behind the translations from more modern Etruscanists like Bonfante, De Grummond or Jannot who continue to translate cvil 'gift'? Shouldn't we be more critical? Aside from Ellis's suspicion that the name Thanacvil contains the same word, the only other instances of cvil are reflected in the phrase Tins cvil which he then translates as "gift of Tinia". I've chosen to stray away from this translation and prefer to understand Tins cvil not as its function but as its title, as an epithet meaning "The eye of Tinia", similar in meaning to the Egyptian "eye of Ra", referencing the power of the sun. Indeed Tins cvil is found on the Etruscan Chimera, a piece that symbolizes the whole year, sporting three heads each referring to the three seasons of the classical year. In usual interpretations of the Piacenza Liver, the work of Martianus Capella is often consulted, attempting to explain one mystery with another. I continue to disagree with that method. I believe that we should look at the artifact itself long and hard, noting its symmetries and asymmetries. One would do better making appeals to ancient Near Eastern religions which are a bit more certain than a curious interpretational work that was created many centuries after the dominance of Etruria. The sequence cvl alp (written from right-to-left in the upper left portion of the above picture) has long been assumed to be an abbreviation for a god *Culsans-Alpan although this is unpalatable to Jean-René Jannot. 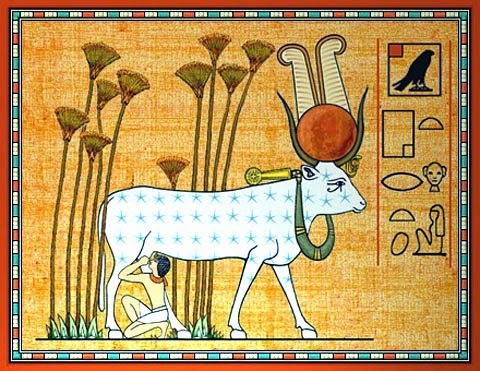 I currently wonder if another interpretation is possible: *Cvil Alphazal 'Eye/face of the Cow'. This instead means that this area would refer to the equivalent of Greek Boopis 'Cow-faced' (an epithet of Hera) and Egyptian Hathor. The Liber Linteus makes mention of a Semitic goddess Estara Alphaza which may also be related. Jannot. Religion in Ancient Etruria (2005), p.163: "Is it Alpan who hides in the second part of the piacenza liver's inscription Cvl.alp? This seems impossible."